You guys, it feels important that I share what a long time coming this project has been for Ben and me. 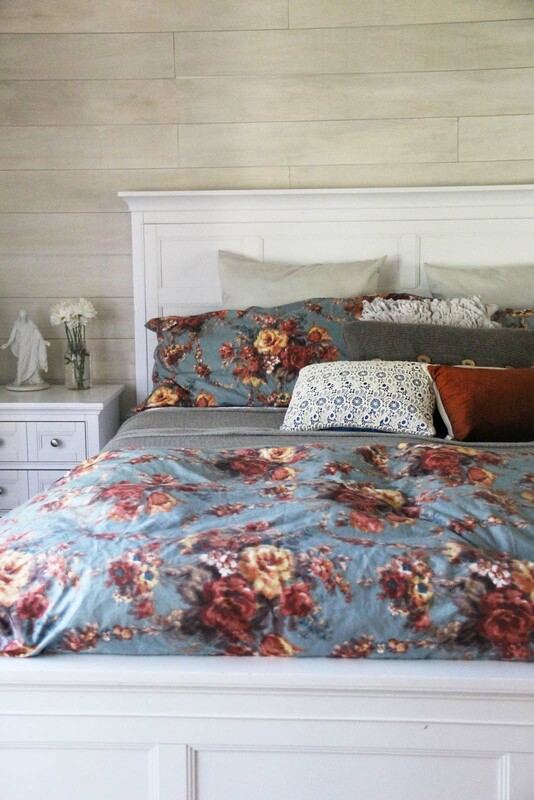 We are coming up on 10 years of marriage and in that time we have never really taken the time to make our master bedroom a sanctuary, a reflection of our hearts and style. I’ll never forget our very first bedroom. We were newly weds, living in a 650 square foot apartment–so so so tiny and we still didn’t have enough furniture or belongings to fill it up. Our bedroom was a display of all the gifts purchased from our registry by our sweet friends and family. But I was 22. I had just graduated college a few months earlier. The only style I had ever paid any attention to revolved around fashion, and to be honest, I was pretty terrible at that too! So when Ben and I went to register we made no effort to discover our personal style. Instead, we played it safe and we made EVERYTHING tan. EVERYTHING. Tan sheets, tan comforter, tan pillows, tan wall frames, tan dresser. And then we crammed all of our tan belongings into a tiny bedroom with only the tiniest of windows letting in the tinniest bit of light. It was dark, and brown, and frankly depressing. But we were newly weds and nothing could bring us down. 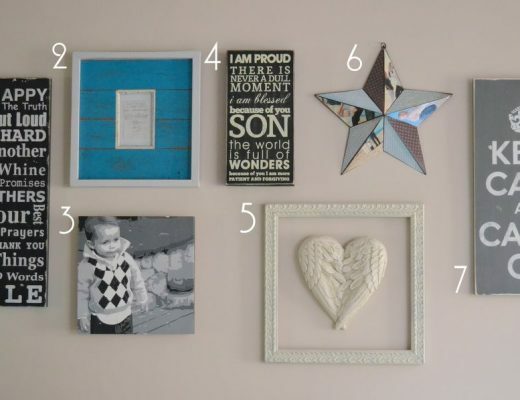 Flash forward a decade, several moves, two kids, career changes, pets and home ownership…and in that time it seemed that all other aspects of our home have taken priority over our bedroom. 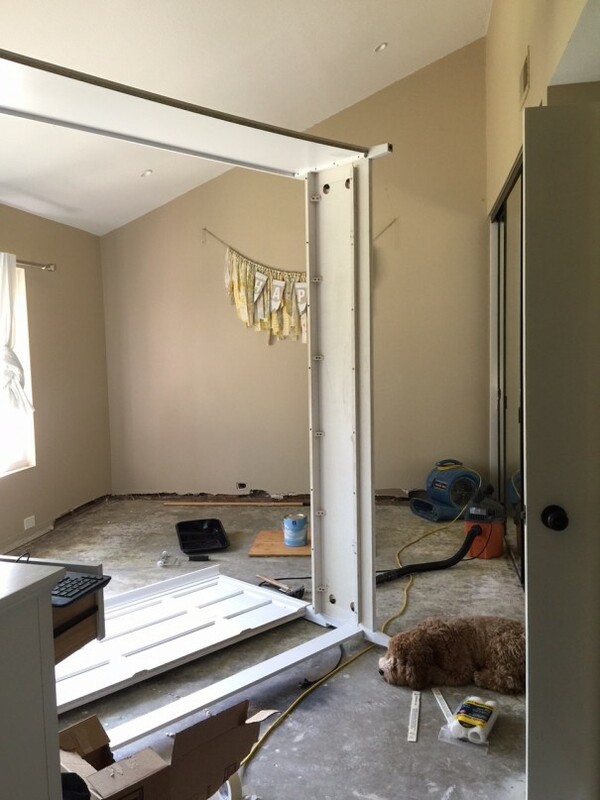 But when the discovery of mold forced us to rip up the carpet and cut out a bunch of drywall, we felt like there was finally no better time than to create a special space just for us (on a budget of course). We still have several finishing touches before this space looks how we have imagined it in our heads, but I was too anxious to share some of our progress with you all. Remember when I posted this, and told you how we were going to go back to our roots and invite some “country-ish”/farmhouse vibes back into our space? 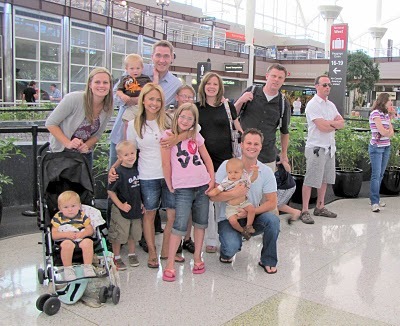 Well I’d say we did just that–and it feels like home! I’ll be honest, it wasn’t easy to ignore current trends and stick to our core stlye. But I’m so glad we did, because this space is really starting to feel like our own. Ripped up carpet and put in hardwood to match the rest of the house. Painted over the dark tan walls with the same light gray as our kitchen and family room. Made a DIY wood planked accent wall and white washed it. Added a 9×7 Ikea jute rug. 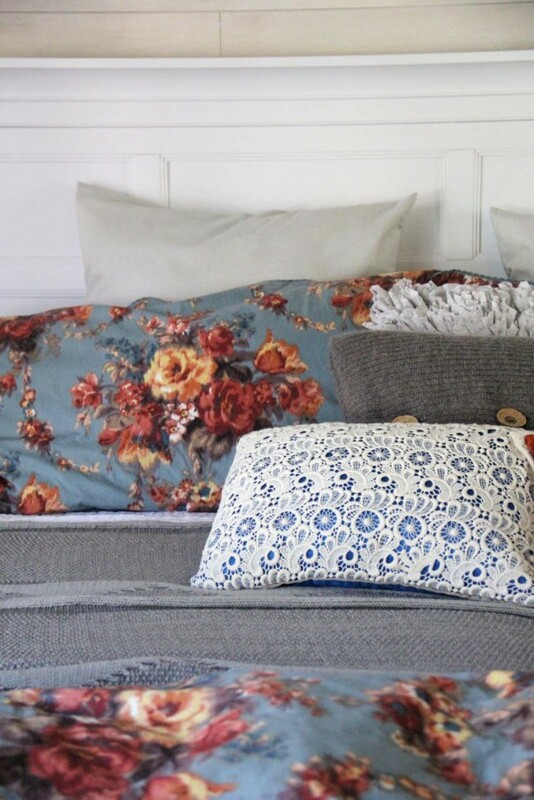 Switched out our ratty bedding with holes for some luxury linens and pillows from Christy Linens. 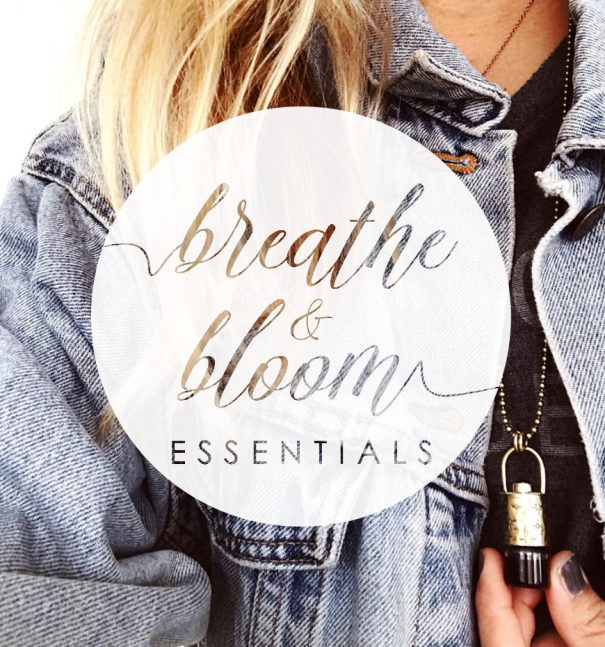 I selected the floral Romany collection because I thought it was perfect for fall and winter. In the spring and summer I would love to switch it out for the bright white Chantilly collection. In the past I have always purchased “inexpensive” bedding. I had NO idea what a differnece quality linens made for a good nights sleep–plus, they wash like a dream! Find something (if anything) to hang above our bed that is earthquake safe. Find a small piece to go next to Ben’s side of the bed since our second nightstand is too large to fit. 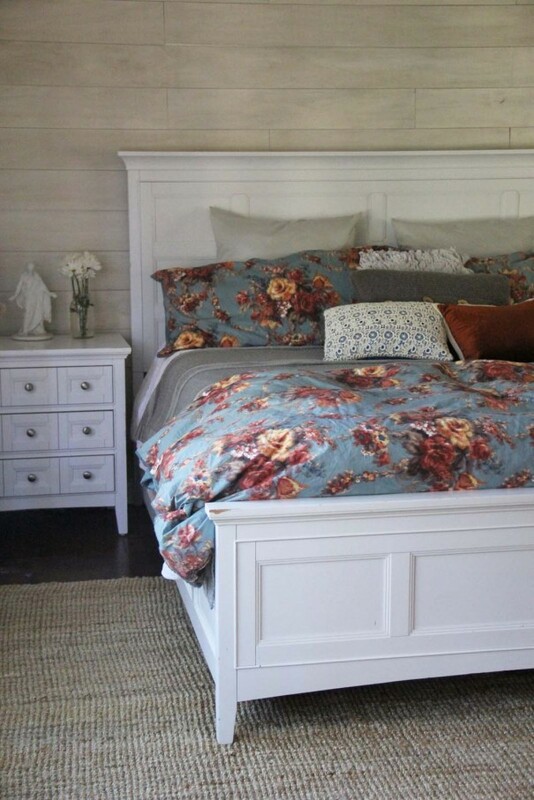 Find a piece (I’m thinking a low profile antique farmhouse wood bench) for the foot of the bed. Either bedside lamps or install unique lighting on either side of the headboard. So that’s the update. 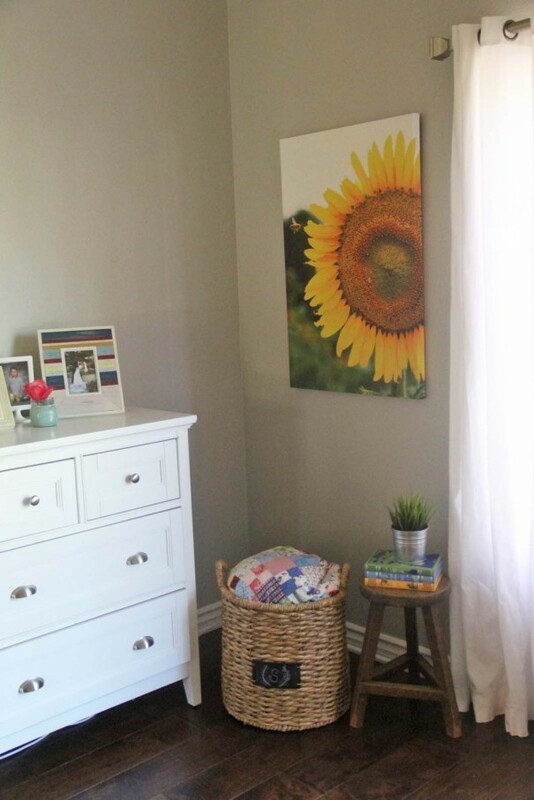 I’d love to know if you guys know of any pieces you think would be perfect for the room (you can leave links in the comments, I love reading your comments!). 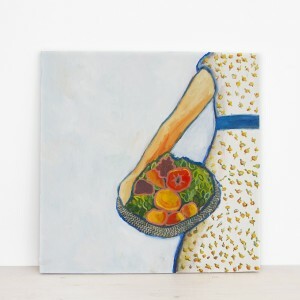 I selected the Romany collection and its absolutely divine! I have never slept better. This piece is one of the best gifts I have EVER received. My friend Lacey got it forus and it hangs in the entry wall of our room. 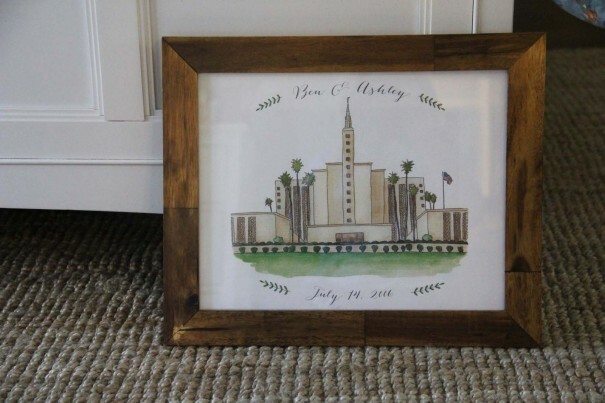 It is a hand painted piece (by Taylor Town Designs) of the Los Angeles temple where Ben and I were married. 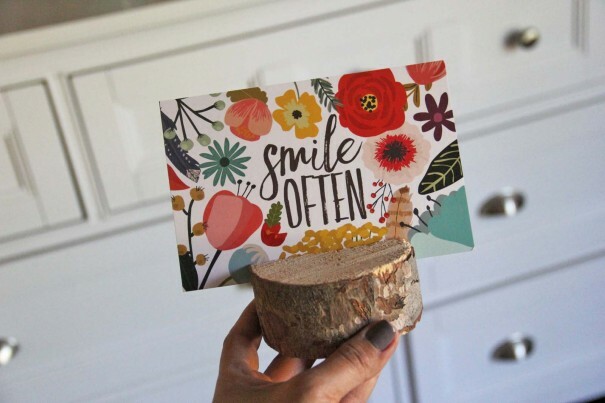 This beautiful quote and stand was sent to me by a dear Instagram friend, Katy Girl Designs–her work is amazing and inspiring! This is so beautiful! You’ve done a great job already. My parents have that furniture and I love it because it is light and bright. 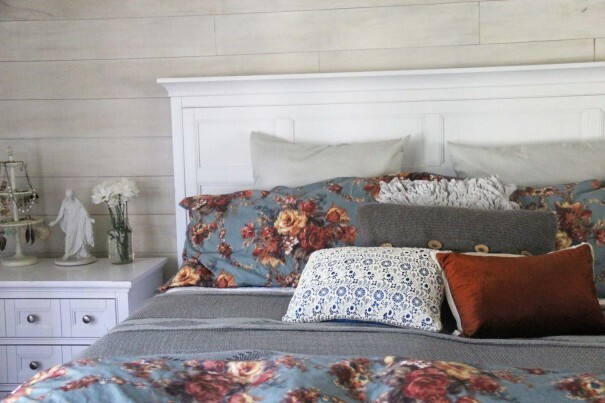 Our bedroom is definitely still in the before stage -probably close to your newlywed bedroom phase (even though we’ve been married for 5 years!) 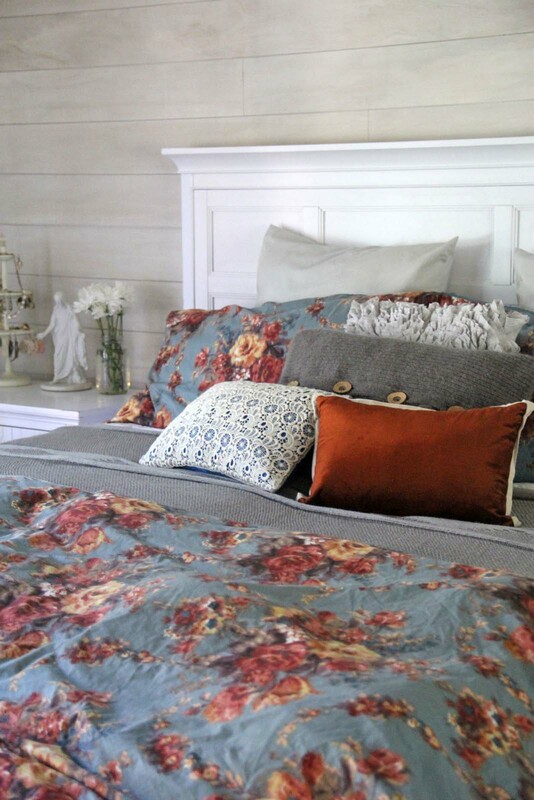 What is it about master bedrooms always being saved for last? Anyway, I absolutely ADORE what you’ve done so far! The wood plank wall is amazing. I have so been wanting to do that to our room, but we’re renting :/ I think unique lighting on each bedside will look awesome. 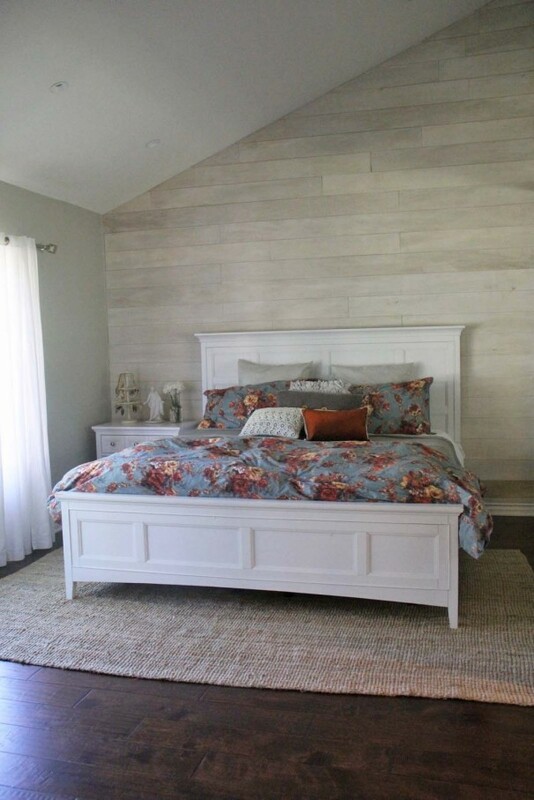 I love the new look, especally the DIY wood planked accent wall! Good for you! The room is looking great. Oh I love the clean look! It looks so modern and cozy! So pretty!! You’ve done a great job! How about something like this for Ben’s side (or both sides). http://www.overstock.com/Home-Garden/INSPIRE-Q-Burkhardt-Tripod-Round-Wood-Accent-Table/8231877/product.html There are several color options and variation on size/ shape. You could do a pop of color or get the white ones to match. Where is the bed from? And dresser? Is the rug soft or really rough? Lovely story of how your upgrade from a 650 sq foot apartment to what it is today, beautiful makeover, I can feel that you are loving your new bedroom.